The Dynasty Queen is one of the most popular high-end and long running luxury coaches ever built and the most stable model in Monaco's line up for many years, and for good reason. When production was halted in 2011 due to the recession, the Dynasty was the first model to come back into production in 2014, followed by the Diplomat. To begin with it rides on a custom built Roadmaster "S" series chassis recognized as the best high-end chassis in its class. Roadmaster is a division of Monaco and exclusive only to models produced by Monaco, they do not build chassis for any other application such as trucks, busses or any other specialty applications. 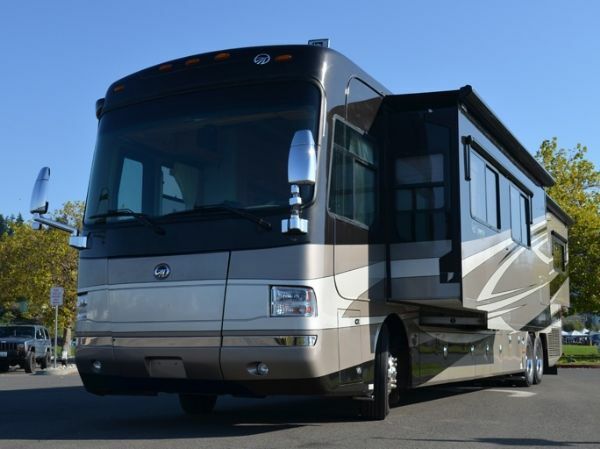 So what makes the Roadmaster so unique?The Dynasty Queen is constructed on Monaco's top of the line Roadmaster S-Series chassis that features 10 air bags to provide a silky sooth air cushion ride. The air bags are located on the outside of the chassis rails to provide more stability when cornering or in windy conditions. The powerful Cummins 400-HP ISL turbo diesel engine produces a whopping 1,200 LB-FT torque that will propel you over the mountains with your car in tow! The super sooth and reliable Allison 6-speed automatic transmission transfers the power and torque of this engine to the drive axel. The 10KW Onan diesel generator will provide all the power you need to operate everything in the coach when shore power is not available.